We offer an extensive selection of fabrics in the latest colors and patterns so you can add your own personal touch to your futon selection. 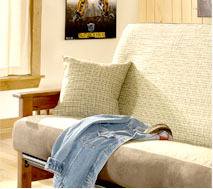 Or restyle your existing futon by simply updating it with a new cover! What could be easier?